The main difference between libel and slander is that libel refers to a written defamatory statement while slander refers to a spoken defamatory statement. Defamation is a false statement presented as a fact that causes injury or damage to the reputation and livelihood of a person or an entity. Thus, libel and slander are two types of defamation. In brief, defamation means ‘the communication of a false statement that, depending on the law of the country, harms the reputation of an individual, business, product, group, government, religion, or nation‘. A defamatory statement can be made in any medium, either in the printed (including images as well), audio, audio-visual, or virtual media. These defamatory statements should be either published or communicated to a third party. Consequently, it is a tort or a civil wrong. Therefore, the subjected person or the entity (plaintiff) can take legal measures regarding the damage caused to their reputation, by proving that particular defamation was a lie. However, minor factual errors such as getting a person’s age wrong would not be considered defamation of any sort. Therefore, this defamation Publication ‘must be a statement expressed as a factual statement and is not clearly identified as an opinion’. Libel is an untrue defamatory statement that is made or published in the written form, either as written or printed words, pictures, etc. Similarly, defamatory statements on any website would always be libellous rather than slanderous. 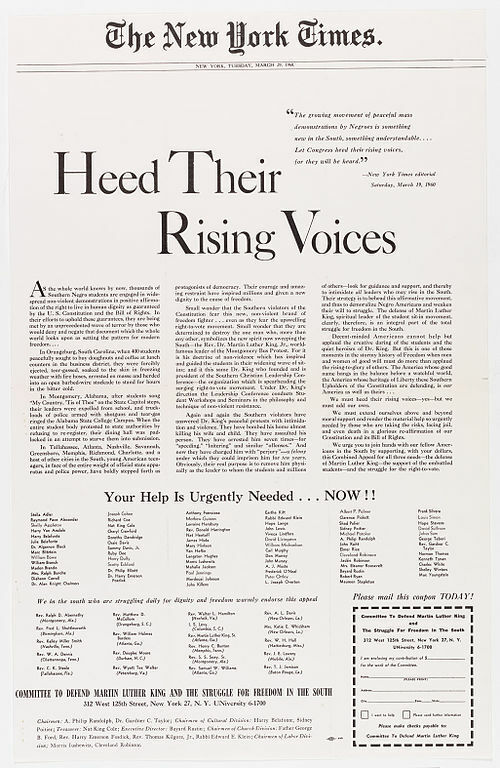 Therefore, the legal dictionary defines libel as ‘involves publishing a statement about someone in written form or via broadcast (for example, on radio, television or Internet) that is untrue and would harm the reputation or livelihood of that person, by tending to bring the target person into ridicule, hatred, scorn or contempt of others’. As a consequence, the victim or the plaintiff can open a lawsuit. Moreover, the law of libel originated in the 17th century in England. With the growth of publication, the cases of libel also increased. Moreover, whether a published statement is libel or not depends on the person claiming to have been harmed. Therefore, it is on the opinion of the plaintiff whether to consider a certain publication or the spoken statement as defamatory. Slander is an untrue defamatory statement that is done verbally. 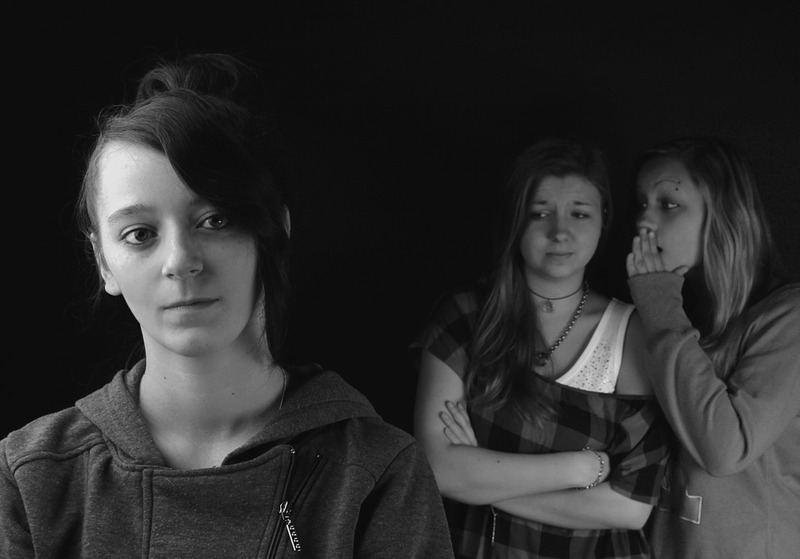 Slander applies to defamation made in a transitory form, such as spoken words or gestures. Statements made in anger or malice that are often untrue, are commonly viewed as slander. Slander can be made face-to-face, or by phone, voicemail, or broadcast. Therefore, slander law is concerned with defamatory speech. Slander may also consist of the use of private information or facts which are publicly disclosed without proper authority or permission. Moreover, if the offending material is published in some fleeting form, as by spoken words or sounds, sign language, gestures or the like, then also it is slander. There must be solid evidence, which in the case of slander, means that the statement is made to a third party. Some statements, such as an untrue accusation of having committed a crime, having a loathsome disease or being unable to perform one’s occupation, are treated as slander since the harm and malice are obvious. If the plaintiff is successful in proving the defamatory statements, and that they caused damage to the plaintiff’s reputation, he may be awarded monetary damages. it was made without adequate research into the truthfulness of the fact. However, since slander is in the verbal form, the plaintiff must be able to prove that the defendant had, actually, said the statement and that there is a third party that can attest to that verbal statement. Both libel and slander are types of defamation and therefore can be sued in a civil court. Both these acts should have malicious intent to be regarded as defamation. Libel refers to written or published defamatory statements while slander refers to verbally committed defamatory statements. Since libel is in the written form, it is found in printed media such as newspaper, magazines, and on blogs, social media websites, etc. On the contrary, since slander is a verbal defamation, it is found in television programmes, on varied public gathering places, face-to-face, by phone, voicemail, etc. The punishment for general libel is monetary and fine. Punishment for seditious libel, which is considered a crime (ex: to criticize public officials), is imprisonment. Also, the punishment may vary with regard to the law in the particular country. On the other hand, the punishment for slander is civil lawsuit and financial damages. However, in cases where some countries regard slander as a crime, the punishment may vary. Defamation is a tort that is related with the civil law with regard to the safeguard of civil privacy and reputation, and libel and slander are two types of defamation. 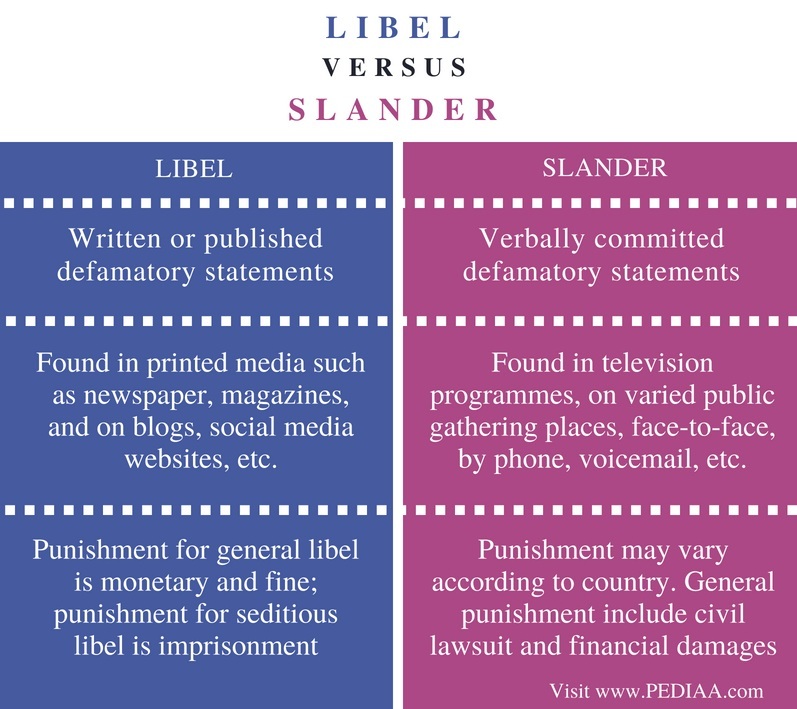 Hence, the major difference between libel and slander is that libel refers to defamation in written form or defamatory publications while slander refers to defamation in verbal form or defamatory speech. Even though the right to criticize people or entities and publicly share information concerns one’s personal freedom, it is illegal to malign the reputation of another through slander or libel. 1.“Defamation.” Wikipedia, Wikimedia Foundation, 3 July 2018, Available here. 2. “Legal Dictionary – Law.com.” Law.com Legal Dictionary, Available here. 3. Probasco, Jim. “Slander.” Investopedia, Investopedia, 30 June 2018, Available here.